Why choose the Rali Sports Hand Grip Strengthener? Develop strength on your hands, fingers, wrist, and forearms. It helps you to work out each finger individually for the best and effective result. Excellent hand strength excises for people who have Arthritis, Tendonitis, Carpal Tunnel, and those who are recovering from a tendon surgery. Ideal for athletes, musicians, rock climbers, bodybuilders, golfers, tennis players, masseuse and vehicle drivers. And for a people who work with hands. Ergonomically designed to fit small to large hand sizes. Perfect for men, women, seniors, and teens. Where and when to use? 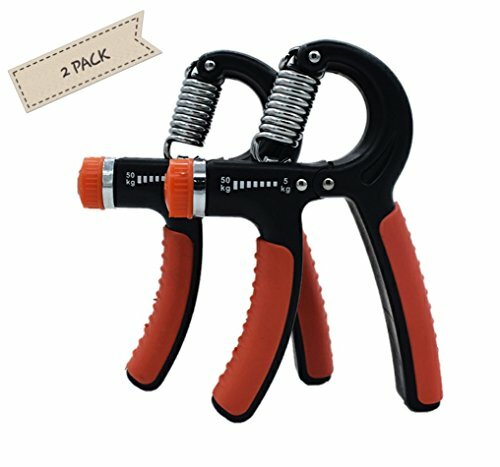 You can take this hand exercise equipment with you whenever you go out to work or for your daily workouts. Perfect hand workout that can be done in your home or office and will build your hand and grip strength with just 5 minutes per day. Hand strengthener is ideal for improving strength, power and speed in the wrists, fingers and works as a forearm exerciser. For people who have Arthritis, Tendonitis, Carpal Tunnel, and those who are recovering from a tendon surgery. Comfortable rubber non-slip handles and top quality design with stainless steel extension springs. Durable and safe, it will not damage your hands and fingers. The grip handle is small enough to fit into your gym bag or pocket. You can enjoy exercising during work or leisure. Exercise your hand anywhere and anytime. If you have any questions about this product by Rali Sports, contact us by completing and submitting the form below. If you are looking for a specif part number, please include it with your message.